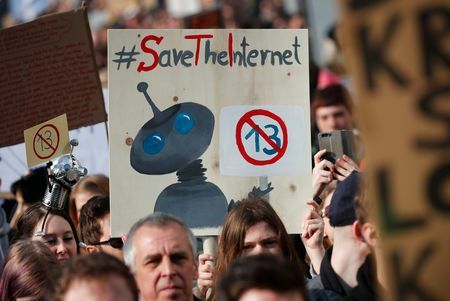 BRUSSELS (Reuters) – Europe’s creative industries are urging EU lawmakers to back a proposed overhaul of the bloc’s copyright rules, putting them at odds with internet activists who oppose a requirement to install filters to block copyright material. Artists in favour of the proposed changes include film producers Pedro Almodovar and Michel Hazanavicius, Benny Andersson from Abba and author Ali Smith, as well as independent music labels. A vote in favour by the European Parliament would pave the way for the reforms to become law. “This is not the modernised copyright law that creators and consumers need, but rather another attempt to protect an industry that has consistently resisted to deal with the impact of technological change on their business model,” BEUC’s Director General Monique Goyens said in a statement.